This thrilling and scenic ecological adventure is one of the most convenient tours Ketchikan Alaska has to offer; because it begins right at your cruise docks! Just steps away from your cruise ship, you’ll load up your unique hovercraft vessel for a tour to a secluded local beach. As you make your way along on your Hovercraft Eco Adventure and Wildlife Viewing Tour, your naturalist guide will share their knowledge of Ketchikan’s coastal ecosystem & the unique craft you are riding in. Then, they will teach you all about the 20-inch “air-cushion” below your vessel and explain what makes the hovercraft an eco-friendly alternative to other cruising options. It’s perfect for the conscious traveler looking to preserve the environment they are exploring. Keep your eyes peeled for wildlife as you cruise along Revillagigedo’s rainforest coast to your scenic beach landing. Seals, porpoises, and eagles are known to make appearances! When you reach the beach, your hovercraft will fly right onto the shore as a result of it’s “air-cusion”! 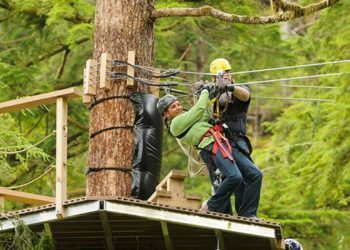 This exciting transition is a thrill you won’t find on any other crafts or tours Ketchikan Alaska offers. After your hovercraft comes to a stop, get out, stretch your legs, and explore the stunning shoreline. From here, your Hovercraft Eco Adventure and Wildlife Viewing Tour takes you back out onto the water for more wildlife opportunities. Because of this, be sure ave your camera ready as your keen-eyed guide points out any animals along the way. Sightings could range from something as small as a starfish to as large as a humpback whale! To finish our the Hovercraft Eco Adventure and Wildlife Viewing Tour, you will again skirt the beautiful coastlines of Revillagigedo as you hover your way back to the cruise docks. Make sure to charge your cameras before this one, the up-close views, truly unique travel experience & abundant wildlife opportunities make this one of the tours Ketchikan Alaska offers that you won’t want to forget! As a shorter excursion, this tour pairs well with others! Maybe take to the skies to see the Misty Fjords after your boat tour. You could also head over to the famous Lumberjack Show paired with a delicious crab feast! Answer: The total duration of this activity is about 1.25 hours from start to finish. The meeting location will be just next to the Ketchikan Visitor's Bureau, which is conveniently situated very close to the cruise docks. Of course, you'll receive detailed meeting instructions and planning information in a confirmation email upon booking. Answer: Ketchikan is in the heart of a temperate rainforest, and we would never do anything if we stopped for the rain. Please do not let the possibility of rain deter you from booking. Southeast Alaska is at its most beautiful on misty rainy days. What should I wear and how should I prepare for this tour? Answer: No special equipment is necessary for you to bring. Dress warmly and in layers as the temperature can fluctuate throughout the day. Life jackets will provided for the ocean portion of the trip, and we recommend bringing gloves and an extra pair of socks for your comfort.